Barbara is a Sitcom programme. 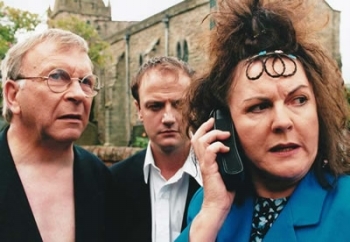 This brilliant sitcom follows the life of an out-spoken, no-nonsense Yorkshire woman called Barbara Liversage (Gwen Taylor) has become the agony aunt, problem-solver and all round sounding pole for her extended family. Her husband, Ted (Sam Kelly), has the most amazing adventures during his jobs as a cabbie. Their outrageous son-in-law, Martin Pond (Mark Benton), is a journalist for the local TV station and seems to investigate the most bizarre stories you've ever heard. You would think that at work she could escape all of this, but.. No! She continually gets it in one ear from the other receptionist, Doreen (Madge Hindle), whose husband becomes involved in the most perverse of activities and in the other ear she gets it from her sister Jean (Sherrie Hewson) who just loves telling everyone about her latest sexual conquests and exploits. Through it all though, Barbara struggles vainly on in the desperate hope that one day she may be awarded with a quieter life!